St Kilda must assume a degree caution in the clubs push to regenerate, or risk being left to flounder in the bottom rung of the ladder for the next decade. The Saints approach during the initial stages of AFL trade week has been swift and brutal, the club acknowledging the need for a clean out of an ageing and stagnating list. The change in mantra made abundantly clear, with coach Scott Watters pulling the trigger on a deal which sent ruckman Ben McEvoy – considered by many as a future captain of the club – to Hawthorn in exchange for Shane Savage and pick 17. The deal effectively gives St Kilda three choices within the first 25 (3, 17, 21) in six weeks times at the AFL draft. The potential to emulate Port Adelaide sudden revival this season, seemingly a justification for the radicalism shown by the Saints, with stalwarts of the club in Nick Dal Santo, Sam Fisher also both bait on the trade table. No McEvoy (trade); no Milne (retired); no Koschitzke (retired) and possibly no Dal Santo and Fischer. The saints may lose in excess of a thousands games experience this off-season; the team a mere shadow of its 2013 self. It’s enough to leave St. Kilda supporters wondering the depth to which Watters blade may sink to, as deep as skipper Nick Riewoldt? Surely not. What has been made transparent in recent years with the on-going evolution of the AFL’s trade and free agent paradigm is that the period is highlighted by equal parts brilliance and blunder. Indeed the dealing – or perhaps most precisely misdealing – of Melbourne and Brisbane act as cautionary tales which show the disastrous repercussions when club directors get it wrong. Yet these considerations are often pushed aside by star stuck list managers, memorised by the unequivocal trade and free agent successes of Hawthorn, Sydney and Geelong. 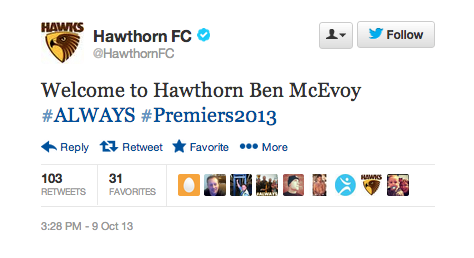 The last three premiers Geelong (2011); Sydney (2012); Hawthorn (2013) each boast a succession of poached players. Brad Ottens played a crucial role in Geelong’s three premierships (2007, 2009, 2011) after leaving Richmond at the end of 2004. Four recycled players Rhyce Shaw, Mitch Morton, Ted Richards and Marty Mattner became premiership players for Sydney in 2012. Hawthorn going one-step further than Sydney, with five players acquired through trade and free agency means, all holding the AFL premiership cup aloft last month as part of the Hawks victorious 2013 campaign. Yet a deal with the devil, can only have one winner. As there is a price to pay in the quest for youth stocks, in a clubs heart and soul. Ironically this very same demon has been left to mock its own, resigning Melbourne to carry out the embarrassment of a rebuild of a rebuild. Two coaches, six years and a cavalcade of missteps later, the demons are still in post-season exile. Striking similarities are evident in the current position of St Kilda and Melbourne under Dean Bailey and Mark Neeld. The Demons opted for almost total reboot of their list, pushing retirement on Brad Green, Brad Miller and James Macdonald. Now St Kilda faces the same dilemma in how to treat their own stars of yesteryear. If St Kilda wishes to avoid the same fate they must strike the balance in obtainment of youth and retention of experience. The latter, especially pertinent, as if completely neglected (a la Mark Neeld) it may be to the detriment of the former. In this order the Saints must act: first thoughtful selection must be carried out at this year’s draft, nothing short of a genuine star at pick three will do. This talent must then be nurtured; something ignored in the development of Melbourne top draft picks Tom Scully, Jack Trengove, Cale Morton and Jack Watts. A task not made any easier with apparent loss of football knowledge from the likes of Nick Dal Santo and Sam Fisher. So what am I suggesting? The answer: extreme caution. It’s easy to fall into the trap of treating players as proverbial chess pieces to be moved about the board with utter indifference. Only to make one wrong move: checkmate. Cal Godde is a second-year Journalism (sport) student at La Trobe University. Follow him on Twitter @CalGodde.